More than 580 delegates from 46 countries across the globe converged in the historical town of Livingstone in the south of Zambia to share knowledge, information, and expertise; deliberate on issues; build and reinforce partnerships; and discuss the state of the art in grain legume and cowpea research at the highly-successful Joint Pan-African Grain Legume and World Cowpea Conference. 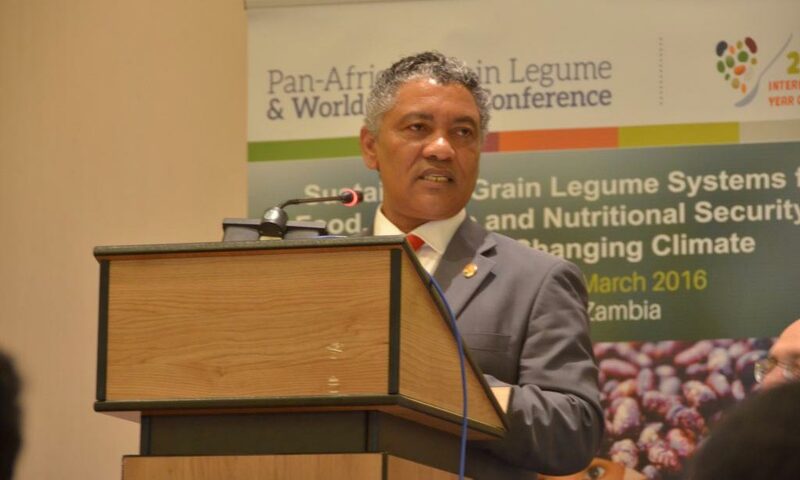 Zambia Minister of Agriculture Honorable Given Lubinda giving his keynote speech at the opening of the Joint Pan-African Grain Legume and World Cowpea Conference on 29 February at the AVANI Victoria Falls Resort in Livingstone, Zambia. The meeting was held 28 February to 4 March at the AVANI Victoria Falls Resort. Delegates included eminent scientists, researchers, academia, agriculture and nutrition campaigners, food and nutrition experts, and private and public sector players engaged in grain legumes and cowpea research, development, and enterprises. The international confab was organized by IITA in partnership with the Feed-the-Future Innovation Lab for Collaborative Research on Grain Legumes (Legume Innovation Lab) and the International Center for Tropical Agriculture (CIAT), in collaboration with major international agricultural research organizations and development partners and sponsors. 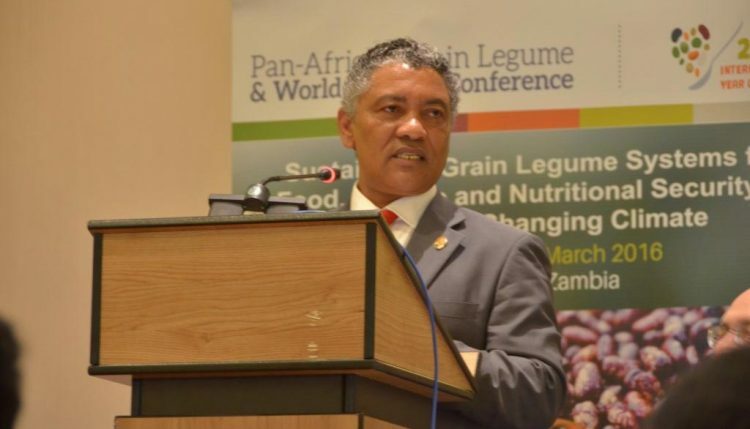 The conference is one of the 10 global signature events recognized by the Food and Agriculture Organization (FAO) of the United Nations as part of the celebration of 2016 as the International Year of Pulses (IYP), and is the only FAO-sanctioned IYP signature event for Africa. Panoramic shot of the delegates during the official opening of the Joint Pan-African Grain Legume and World Cowpea Conference. With the theme “Sustainable Grain Legume Systems for Food, Income and Nutritional Security in a Rapidly Changing Climate”, the conference covered 13 subthemes: Abiotic Stress; Biological Nitrogen Fixation; Economics and Value Chain Development; Gender and Youth; Genomics and Plant Breeding; Human Nutrition and Health; Integrated Pest Management; Mechanization of Production and Postharvest Handling; Plant Pathology; Seed Systems; Sustainable Intensification; Technology Dissemination and Impact Assessment; and Value Addition and Food Processing. Conference delegates viewing some of the posters during the poster session. More than 120 research papers were presented as oral presentations in plenary and breakaway sessions, whereas 400 papers were presented as scientific posters. Approximately 900 scientific abstracts were submitted for inclusion in the conference. Additionally, nine organizations set up booths at the conference’s Technology Marketplace exhibition area to demonstrate technologies related to the theme of the conference.